The purpose of the school growth process is to improve the life chances of each learner at each school in Yukon. The school growth process has three parts, annual school growth planning, evidence-based conversations at each school throughout the year and school reviews conducted with each school and its community every three years. The school growth process is based on the expectation that staff, school councils, parents, the First Nations community, Elders, and students will work together to make plans, determine appropriate actions, and monitor progress to achieve improved results for all Yukon students. 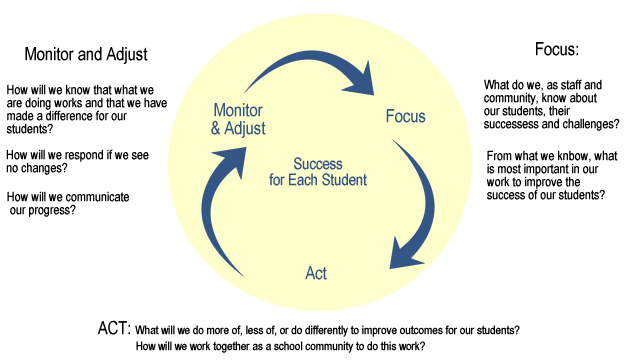 The school growth process focuses on continuous improvement and the use of inquiry as outlined in the graphic.